2019 03 31 4th Sunday in Lent - Pastor Mander, Sermon Title "What's Next?" 2019 03 24 3rd Sunday in Lent - Pastor Mander, Sermon Title "God's Way, My Own Way"
2019 03 17 2nd Sunday in Lent - Pastor Mander, Sermon Title "Observe Those Who Live"
2019 03 10 1st Sunday in Lent - Pastor Mander, Sermon Title "Jesus, Daniel & Johnny"
2019 03 03 Transfiguration Sunday - Pastor Mander, Sermon Title "Listen"
2019 02 24 7th Sunday after the Epiphany - Pastor Mander, Sermon Title "Even, My Enemy?" 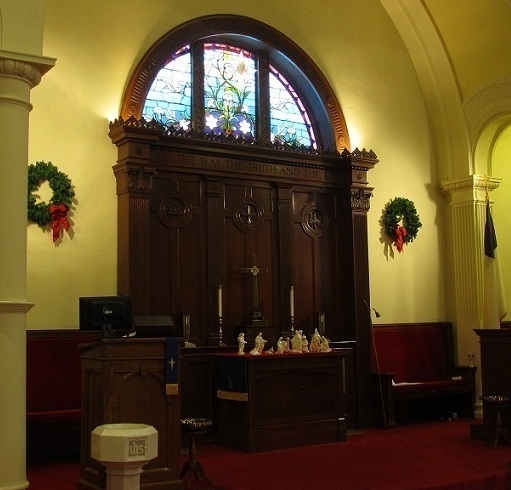 2019 02 17 6th Sunday after the Epiphany - Scout Sunday - Pastor Mander, Sermon Title "Ebenezer"
2019 02 10 5th Sunday after the Epiphany -- Pastor Mander, Sermon Title "Be Loving"
2019 02 03 4th Sunday after the Epiphany - Pastor Mander, Sermon Title "Be Joyful"
2019 01 27 3rd Sunday after the Epiphany - Pastor Mander, Sermon Title: "Be Peaceful"
2019 01 20 2nd Sunday after the Epiphany - Dr. Rev. Donald Marks, Sermon Title: "Those Intangible Religious Benefits"
2019 01 13 1st Sunday after the Epiphany - Pastor Mander, Sermon Title "Be Kind"
2019 01 06 Epiphany - Pastor Mander, Sermon Title: "Find"
2018 12 30 1st Sunday of Christmas - Pastor Mander, Sermon Title: "Search"
2018 12 23 - 4th Sunday in Advent - Pastor Mander, Sermon Title: "Welcome"
2018 12 16 - 3rd Sunday in Advent - Pastor Mander, Sermon Title: "Do"
2018 12 09 - 2nd Sunday in Advent - Pastor Mander, Sermon Title: "Refine"
2018 12 02- 1st Sunday in Advent - Pastor Mander, Sermon Title: "Stand"
2018 11 25 - Last Sunday after Pentecost - Lay Speaker Mike O'Shea, Sermon Title: "Thanksgiving - More Than a Meal"
2018 11 18 - Twenty-Sixth Sunday after Pentecost - Pastor Mander, Sermon Title: "Everyone Has a Gift"
2018 11 11 -Twenty-Fifth Sunday after Pentecost - Pastor Mander, Sermon Title: "Unstuck Together"
2018 11 02- All Saints Day - Pastor Mander, Sermon Title: "The Miracle of God's Children"
2018 10 28 - Twenty-Third Sunday after Pentecost - Pastor Mander, Sermon Title: "Great Catch"
2018 10 21 - Laity Sunday - Lancelot Jeff-Macauley, Sermon Title: "The Just Shall Live by Faith"
2018 10 14 - Twenty-First Sunday after Pentecost - Rev. Dr. A.E. Maddison, Sermon Title: "You Can Get There from Here"
2018 10 07 - World Communion Sunday - Pastor Mander, Sermon Title: "D. T. R."
2018 09 30 - Nineteenth Sunday after Pentecost - Pastor Mander, Sermon Title: "Your One and Only"
2018 09 23 - Eighteenth Sunday after Pentecost - Pastor Mander, Sermon Title: "Simon the Pharisee"
2018 09 16 - Seventeenth Sunday after Pentecost - Pastor Mander, Sermon Title: " Nicodemus"
2018 09 09 - Sixteenth Sunday after Pentecost - Pastor Mander, Sermon Title: "An Impartial Faith"
2018 08 26 - Fourteenth Sunday after Pentecost - Pastor Mander, Sermon Title: "Prepare in Love"
2018 08 19 - Thirteenth Sunday after Pentecost - Pastor Mander, Sermon Title: "Give Thanks in Love"
2018 08 12 - Recognition of Graduates - Pastor Mander, Sermon Title: " Live in Love"
2018 07 29 - Tenth Sunday after Pentecost - Pastor Mander, Sermon Title: "A Busy Day"
2018 07 15 - Eighth Sunday after Pentecost - Pastor Mander, Sermon Title: "Life in Jesus"
2018 07 08 - Seventh Sunday after Pentecost - Rev. Dr. A.E. Maddison, Sermon Title: "Leading Like Jesus"
2018 06 24 - Fifth Sunday after Pentecost - Pastor Mander, Sermon Title: "A Couple of Faith Sharers"
2018 06 17 - Father's Day - Pastor Mander, Sermon Title: "John Wesley at Aldersgate"
2018 06 10 - Children's Day Outdoor Worship Service - Pastor Mander, Sermon Title: "Such as I Have - "
2018 06 03 - Second Sunday after Pentecost - Pastor Mander, Sermon Title: "Power Belongs to God"
2018 05 20 - Day of Pentecost - Pastor Mander, Sermon Title: "Not What it Looks Like"
2018 05 13 - Ascension Sunday - Mother's Day, Pastor Mander, Sermon Title: "What Time Is It?" 2018-05-06 - Sixth Sunday of Easter, Pastor Mander, Sermon Title: "Are We Persuaded?" 2018-04-29 - Fifth Sunday of Easter, Pastor Mander, Sermon Title: "The Good News about Jesus"
2018 04 15 - Third Sunday of Easter, Pastor Mander, Sermon Title: "Family"
2018 04 08 - Second Sunday of Easter, Pastor Mander, Sermon Title: "Witness"
2018 04 01 - Easter, Pastor Mander, Sermon Title: "Why Did God Fool the World?" 2018 03 18 - Fifth Sunday in Lent, Pastor Mander, Sermon Title: "Why Do Bad Things Happen to Good People?" 2018 03 04 - 3rd Sunday in Lent, Pastor Mander, Sermon Title: "How Do We Hope in Times of Trouble?" 2018 02 25 - 2nd Sunday in Lent, Pastor Mander, Sermon Title: "God, how can we forgive?" 2018 02 18 - 1st Sunday in Lent, Pastor Mander, Sermon Title: "How do we deal with God's silence?" 2018 02 11 - Scout Sunday, Pastor Mander, Sermon Title: "Mountaintops"
2018 02 04 - Pastor Mander, Sermon Title: "The Sacraments"
2018 01 21 - Pastor Mander, Sermon Title: Jesus' Baptism - "My Beloved"
2018 01 14 - Pastor Mander, Sermon Title: "Light and Darkness"
2018 01 07 - Chapel Church Cafe, Pastor Walter Mander, Sermon Title: "God's Timing"
2017 12 31 - Pastor Mander, Sermon Title: "Temporary Homes"
2017 12 24 - Rev. Mander, Sermon Title: "What Child Is This?" 2017 12 17 - Rev. Mander, Sermon Title: "Joy is our True Home"
2017 12 10 - Rev. Dr. A. E. Maddison, Sermon Title: "The Trumpet Shall Sound"
2017 12 03 - Rev. Mander, Sermon Title: "Come Down Home"
2017 11 26 - Rev. Mander, Sermon Title: "The Reign of Christ"
2017 11 19 - Rev. Mander, Sermon Title: "A Perfect Fitting Yoke"
2017 11 12 - Rev. Mander, Sermon Title: "Lived in Faith"
2017 11 05 - Rev. Mander, Sermon Title: "Clothing the Saints"
2017 10 29 - Rev. Mander, Sermon Title: "Justified by Faith"
2017 10 22 - Rev. Mander, Sermon Title: "Render to:"
2017 10 15 - Guest Speaker, Stephen Michael Tumolo, Sermon Title: "Heart to Heart Connections"
2017 10 08 - Laity Speaker, Lancelot Jeff- Macauley, Sermon Title: "Therefore, Go! with HOPE through Hospitality"
2017 09 24 - Rev. Mander, Sermon Title: "In a Manner Worthy of the Gospel"
2017 09 10 - Rev. Mander, Sermon Title: "Mission Celebration"
2017 09 03 - Rev. Mander, Sermon Title: "Following Christ Together"
2017 08 27 - Rev. Mander, Sermon Title: "On This Rock"
2017 08 20 - Rev. Mander, Sermon Title: "Saved for What"
2017 08 13 - Rev. Mander, Sermon Title: "Saved"
2017 08 06 - Rev. Mander, Sermon Title: "The Lord is Near"
2017 07 30 - Rev. Mander, Sermon Title: "Being Prepared"
2017 07 23 - Rev. Mander, Sermon Title: "Esteemed & Adopted"
2017 07 16 - Rev. Dr. A. E. Maddison - Sermon Title: "Doc and the Giant Zucchini!" 2017 06 18 Father's Day - Rev. Mander, Sermon Title: "Standing in Grace"
2017 06 11 Children's Day - Rev. Dr. A. E. Maddison - Sermon Title: "God's Secret Identity"
2017 5 28 Memorial Day Service - Rev. Mander, Sermon Title: "Giving Witness"
2017_05_14 Mother's Day Service - Rev. Mander, Sermon Title: "Deep Mercy"
2017_05_07 Rev. Dr. Marks' Sermon - Rev. Mander, Sermon Title: "From Where Will My Help Come?"